Emergency numbers: For the Emergency Services, dial 112, or for the Grand Ducal Police, dial 113. Opening hours: General commercial opening hours are roughly between 9.00-18.00 (few remain open until 20.00). Some restaurants open for lunch and dinner, remaining closed in-between. The Duchy's capital of just over 114,000 inhabitants is largely made up of expats, but tourists are still few and far between – great news for those who prefer having the city streets all to themselves. There are a few excellent museums in Luxembourg City (the MUDAM is one not to be overlooked), plenty of Medieval remnants and lookout points to take them in from, as well as expansive dining offerings, including from Luxembourg's astounding many Michelin-starred establishments. Linked to the old town by the imposing Red Bridge, the Kirchberg plateau contains cutting-edge architecture, its glass-defined facades housing various official institutions (including the Luxembourg seat of the European Union), as well as the Philarmonie and MUDAM Museum of Modern Art, designed by the architect whose work includes the iconic glass pyramid of the Louvre in Paris. 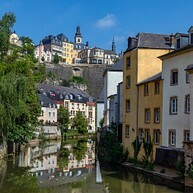 The charming area of Grund in Lower Luxembourg is one not to be missed on a city tour. Take the Saint Esprit lift and descent into the valley, where historic monuments (such as the UNESCO-listed Neumünster Abbey) and 14th century houses forge an inviting atmosphere – especially so when the Grund comes alive at night. There is some excellent dining to be had here, including the Michelin-starred Kamakura and Mosconi. 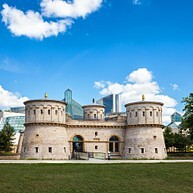 Two former railway roundhouses turned premier cultural hot spot, the refurbished Rotondes complex plays host to multiple artistic events all through the year, from concerts to theatrical performances, exhibitions, design markets, movie screenings, and more. Check the website to see what's on. This panoramic elevator serves as a handy transportation link between the upper city and Pfaffenthal, an area at the very bottom of the Alzette Valley. 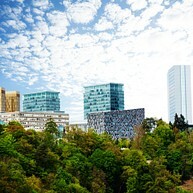 Its glass walls provide unobstructed views of Luxembourg from as high as 70 metres above ground. Riding the elevator is free of charge. The Wenzel Circular Walk is a great way to start off a day of sightseeing: starting at Bock Promontory and via the Castle Bridge, one soon arrives at Chemin de la Corniche, one of the city's most scenic panoramic lookout points. Passing through the Grund Gate and along the Wenzel Wall, you will eventually reach the cultural centre of Neumünster Abbey, following along to Plateau du Rham, containing further defence fortifications. What remains of the impressive network of underground tunnels dating back to the mid-17th century is now open to the public, and belongs to the UNESCO World Heritage list. Part of Luxembourg's extensive defense structures, the Casemates made up the fortification complex that earned the city its proud nickname of "Gibraltar of the North", for being as impregnable as the rock of Gibraltar. Luxembourg's own Notre-Dame (the country's only cathedral) dates back to the early 17th century; it's built in the Gothic tradition, with Renaissance decor elements. The cathedral also contains the tomb of John the Blind. 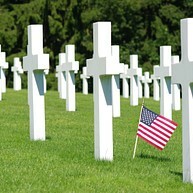 This sobering memorial has become the final resting place for 5,076 American soldiers who lost their lives during WWII. The expansive 50-acre grounds are dotted with sombre white tomb stones, crosses and Stars of David for those of the Jewish faith. There is an informative visitor centre on site. 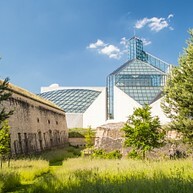 Dedicated primarily to Luxembourg history and art, the MNHA contains artefacts and exhibits spanning the period from as early as the Stone Age to the 20th century, and even features works by masters such as Cézanne and Picasso. 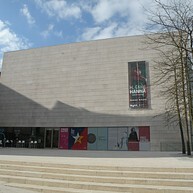 The Luxembourg City History Museum (or Musée d'Histoire de la Ville de Luxembourg in French) contains both a permanent collection and temporary exhibitions dedicated to the city and its past and present. Do not miss the glass elevator with views of the city below. The official residence of the Grand Duke and his parliament, the Grand Ducal Palace ranks among the city's finest architectural pieces. Built in the Flemish Renaissance style in the 16th century, it combines Gothic and Romanticist influences in its interior, and can be visited as part of a guided tour from mid-July until the end of August only. Set in the valley separating the old town from the new, Luxembourg's Skatepark Peitruss is a highly modern hangout spot for those who practice urban sports such as roller-skating and skateboarding, as well as BMX. The Peitruss Valley itself is an attractive site for both locals and visitors, with abundant greenery and recreation areas. 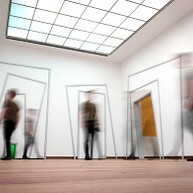 Aiming to showcase the best of modern art, the MUDAM displays a thrilling collection of creations by Luxembourgish and foreign artists spanning design, sculpture, new media and various forms of visual art. 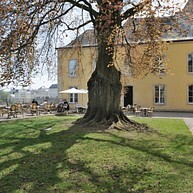 Magnificent views unfold from the Park Dräi Eechelen, where the striking museum building is located. Located an arm's stretch away from nearby MUDAM is the Musée Dräi Eechelen, housed inside a restored 18th century Fort Thüngen. 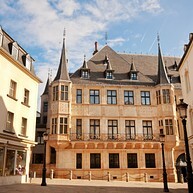 The museum is dedicated entirely to the history of Luxembourg from the mid-15th to the early years of the 20th century, with over 600 original artifacts and documents on display. 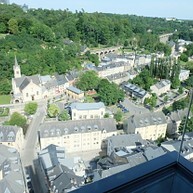 Luxembourg's scenic Pont Adolphe over the Pétrusse River valley straddles the Ville Haute and Gare areas of the city. Apart from being used by traffic, it also has two scenic pedestrian lanes, and is regarded as somewhat of an unofficial symbol of the country itself.